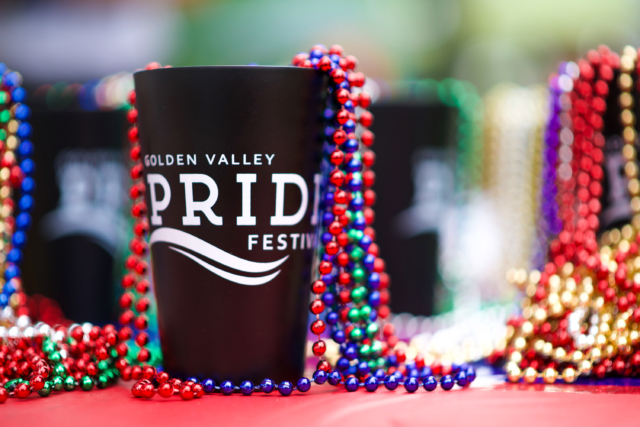 The Golden Valley Pride Festival will take place on Sunday, June 10 at Golden Valley’s Brookview Park. The third annual Golden Valley Pride Festival is going to be heating up the summer this June to celebrate its diverse community. Starting at noon, the event will run until 6 p.m. with music, live performances, food trucks, a beer/wine garden, activities for kids, community booths, and an interfaith church service at Spirit of Hope Church. entertainment and fun,” says Pride Festival Chair Mike Goleski. Goleski says the festival has been so successful each year because community members really love their city, so they enjoy getting involved in a celebration of their city and the growing diversity in the community. With so much to be proud of, it’s no wonder that Golden Valley Pride Festival is such a success for the community, including GLBT community members Kimberly Lang Sanberg, Chad Bulloch, and John Sweet. Sanberg says her family moved to Golden Valley five years ago when their son was 18 months old. “It was especially important that we find a community where our family—a family with two moms—would be welcomed. All of our neighbors, from the young kids to the folks in their 90s, have been completely welcoming of our family since we moved here. We love it here,” she says. She says Golden Valley has a reputation for being a very open, welcoming community where everyone enjoys attending the Pride Festival, including city council members, the mayor, and state legislators. “I’ve gone every year. I was one of the founding planning committee members, so I’ve been involved since the first annual Golden Valley Pride Festival in 2016,” Sanberg says. She recommends bringing the whole family to Pride Festival and biking or walking if possible. There is also a shuttle service available, she says. 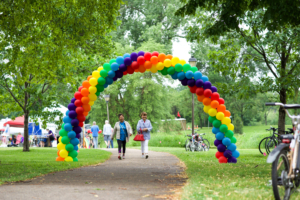 “The Golden Valley Pride Festival is so fun. There’s something for everyone and it’s very family-friendly. There are great food trucks, community booths, kids’ activities, music, and a beer garden. It’s a great opportunity to come together and celebrate the GLBT community in Golden Valley,” Sanberg says. Bulloch says he and his husband also found Golden Valley to be extremely welcoming. He says every neighbor, business and city worker has been more than nice in every way. 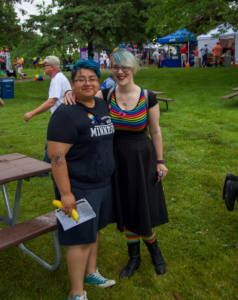 “Pride Fest here in Golden Valley is a very welcoming gathering of not only the GLBT community, but our straight allies, as well. We enjoy seeing the businesses that choose to participate in the Pride Fest and have done our best to push business their way,” Bulloch says. Bulloch says he has attended Pride Fest with his husband since they moved to Golden Valley two years ago, and they plan on continuing to attend. For newcomers, Bulloch says there’s only one thing you need to bring: an open mind. “I would recommend coming with an open mind. I was astounded by all the support of our neighbors across the city. They brought their children, their grandparents, and I’m sure their other neighbors, as well,” he says. According to Sweet, Golden Valley is a “progressive part of town,” but it can be easy to forget how progressive it is because being known as gay in Golden Valley has never been an issue for him. “We are surrounded by straight neighbors that have the yard signs stating, ‘All are Welcome Here,'” Sweet says. Sweet and his husband have attended Pride Fest twice, and they plan on attending this year, too. The first time they were just visitors, but they went the second year to represent Sweet’s clinic Hennepin Healthcare at their booth. “It’s great to see local businesses large and small celebrating Pride. It makes you appreciate the neighborhood store that wants to show their support,” Sweet says. Sweet says if you’re planning on going, you should bring your friends and an appetite. Not only do community members attend, but they are also deeply involved in the planning process of Pride Fest, says Goleski. Goleski says they are looking forward to seeing the work of the Golden Valley community pay off with their third annual Pride Fest. “Each year, we are thrilled with the high level of community businesses and individuals who have offered financial contributions to our great event,” he says. For more information on how you can help, either through your time, talent or treasure, visit: www.goldenvalleypride.com.